Mahwah will reap what Robert Hermansen sowed | Did They Vote? The 9 count complaint focuses on two areas that have been covered at length in my previous posts. This post will cover the one that may be felt the most by residents – the demand to return over $3.4 Million given to Mahwah through Green Acres grants. There’s a contract that goes along with the funds that the public offers to municipalities. The contract demands you abide by the NJSA and mandates you can’t act in a manner that discriminates in an unlawful way. If you violate the ‘Law Against Discrimination’, by say, not permitting people to use parks through ordinances designed to keep out Jews from Rockland County, that money is subject to being clawed back. Mahwah signed the contract and placed its parks on the Recreation Open Space Inventory (ROSI). If you’re a non-Jew from NY, you have a special pass to use the parks. If you’re a Jew from Rockland County…. no such luck. This wasn’t a close call. 30. 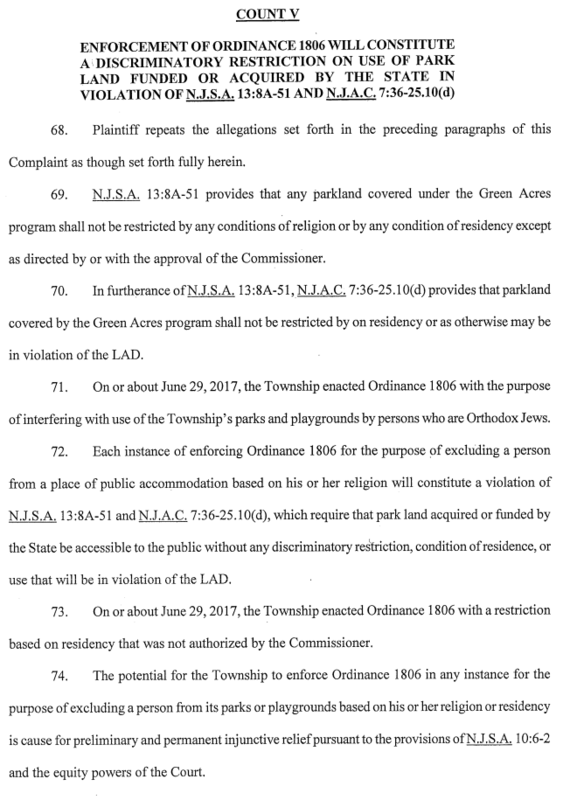 The Township’s actions around the time Ordinance 1806 was enacted indicate that the ordinance was not targeted at all out-of-State residents, but rather to those who are Orthodox Jews. The Township worked on the preparation of signs it planned to place in the parks to address the restrictions in the ordinance. 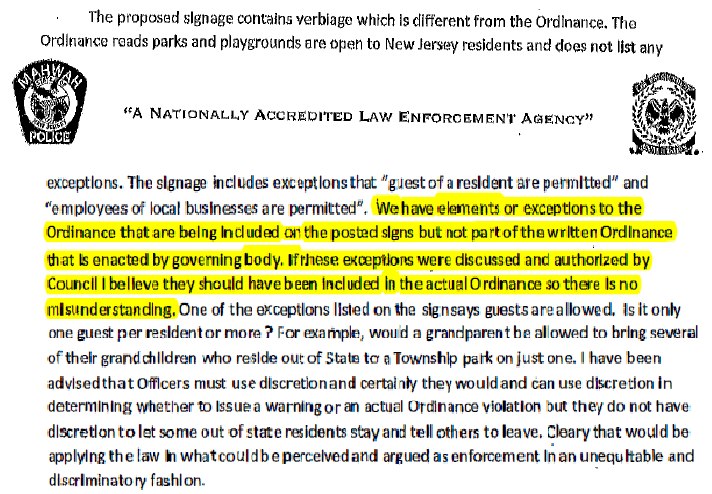 The proposed signage stated that parks were open only to New Jersey residents, but also included the statements that “GUEST OF A RESIDENT ARE PERMITTED USE” and “EMPLOYEES OF LOCAL BUSINESSES ARE PERMITTED USE.” Neither of these exceptions was included in the ordinance. When your chief of police and county prosecutor inform you that enforcement is not possible because you’re ordinance likely violates rules against discrimination and the Constitution, the appropriate response is to rescind the ordinance. Robert Hermansen dug his heel in further. Following the advice that this ordinance was ill-conceived and likely violated the Law against discrimination, the Township’s Council President introduced Ordinance 1811 (introduced on July 27th), in an attempt to create a civilian Police Director position, which would make the Chief of police subordinate to his own control. And now, as the County V of the complaint makes clear, the people of Mahwah may be required to cough up close to $3.4 Million because they violated the contract that came along with the grants of funding they received from taxpayers across the County and the State. The Mayor of Mahwah estimates the total bill can come in around $10 Million.